This 7.5 acre complex comprises the War Memorial Opera House, Memorial Court, the War Memorial Veterans Building (including Herbst Theatre and the Green Room, which is a classically styled reception hall), the Harold L.
This 7.5 acre complex comprises the War Memorial Opera House, Memorial Court, the War Memorial Veterans Building (including Herbst Theatre and the Green Room, which is a classically styled reception hall), the Harold L. Zellerbach Rehearsal Hall, and Louise M. Davies Symphony Hall. 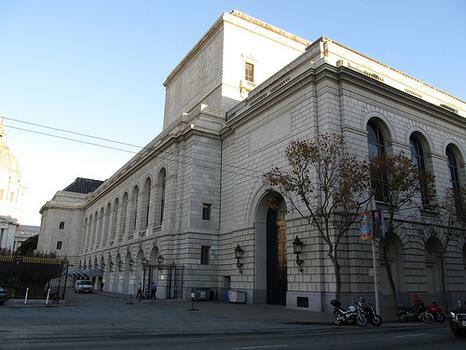 The opera house and the veterans buildings (which are for the most part identical), along with the court, were intended to be appreciated in unison, and to compliment the surrounding architecture of the Civic Center. Their 'Beaux-Arts' structures employ the Roman Doric Order and were designed by architect Arthur Brown, Jr. Both buildings were completed in 1932. Guided tours of the buildings are available.